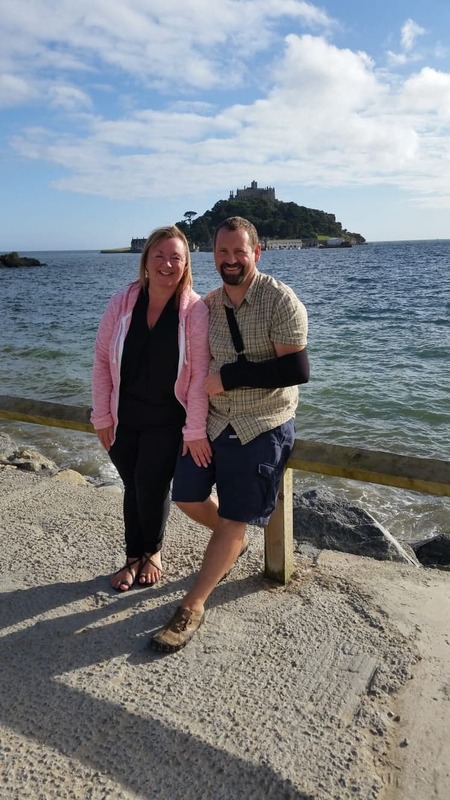 A motorcyclist who was knocked off his bike as he returned from picking up an engagement ring has thanked the crew of Cornwall Air Ambulance that helped keep his proposal dream alive. Shane Bamford was heading home on the A394 on September 4, when a car pulled out in front of him at the Longdowns junction and smashed into his motorbike. The 45-year-old was knocked onto the road, badly injuring his shoulder and arm. A nearby driver, Will, came to Shane’s assistance until a land ambulance arrived on the scene, but worried that he might have a broken pelvis, they requested Cornwall Air Ambulance. The air ambulance arrived on scene at 3.15pm and paramedics Pete Storer and Kris Lethbridge administered pain relief to Shane. Shane was conveyed to Royal Cornwall Hospital where tests revealed that he had a fractured collarbone and a crushed nerve in his arm. He was joined at the hospital by partner, Tracy Snooks, where staff played their part in hiding the ring to keep the engagement a surprise. Shane’s plans all went ahead on schedule, and he proposed to partner, Tracy Snooks, on her birthday on September 11. Each year, Cornwall Air Ambulance carries out around 800 missions throughout Cornwall and the Isles of Scilly. As a charity it relies on donations to carry out this lifesaving work. Help keep Cornwall Air Ambulance flying, donate here.